Exercise is an effective non-surgical way of managing rotator cuff pain and preventing further episodes. Incorporate stretches like pendulum, passive internal, and external rotation to improve flexibility. Perform range of motion and strengthening exercises like elbow flexion, extension, and rotations with elastic bands to strengthen the shoulder’s supporting muscles. The rotator cuff is a group of four muscles – supraspinatus, infraspinatus, teres minor, and subscapularis – and their associated tendons that keep the ball or head of the humerus (upper arm bone) in the shoulder socket and form a cuff over the top of the bone – hence the name. The rotator cuff keeps the shoulder stable and helps you rotate and lift your arm. Exercise restores flexibility, increases your range of motion, and strengthens the muscles that support the affected joint, effectively easing the pain and stiffness and making them less likely to be injured. So, what are your options if you have rotator cuff pain? For any kind of joint pain, pain relief medicines, hot and cold packs, and other quick fix measures may offer temporary relief but to be pain-free, you need something long-lasting. That is where a good exercise routine fits right in. While it may seem counterintuitive to move the part that hurts, regular exercise can strengthen the joint and even help you postpone or avoid surgery on a joint that has been troubling you for a long time. Your doctor will be able to confirm how soon and how often you should exercise if you have injured your shoulder. Unless your injury is serious and requires complete immobilization of the part, a trained physiotherapist will sign off on a routine that helps ease your pain. But never jump into a new exercise routine for pain relief without proper guidance, especially if it is a severe or chronic pain or if you are recovering from surgery. The physiotherapist will analyze your degree of pain, your abilities, and limitations, and design an appropriate exercise routine. You will be made aware of the precautions you should take, proper and effective exercise techniques, and soreness and pain you should not overlook.4 In all likelihood, your routine will combine some of the stretching and strengthening exercises we’ve listed here. If you are are recovering from shoulder surgery or cannot do standing exercises for any reason, many of the exercises listed below can be done lying down. However, make sure you exercise under medical supervision if you are in your post-surgery period. You could walk or ride a stationary bicycle for about 5–10 minutes. Take care to stretch to the point of tension but stop before you experience any pain. The exercises listed below are not in any particular order. They are exercises that will stretch the shoulder and back muscles so that you can regain your range of motion and get the muscles ready for the strengthening exercises. On average, do the stretching exercises 4 times across the day, with 4–5 repetitions on each side. Stand near a counter, a table, a chair back, or a railing. Lean forward, placing one hand on the table or counter for support. Let the other arm hang free. Swing the arm gently forward and backward. Next swing it side-to-side, and then in a circular motion. Repeat the same sequence with the other arm. There is another way to do the pendulum exercise. Bend your knees and use one knee to prop up your hand. Essentially, you bend over at the waist to rest one arm on the knee on the same side. For example, place your right arm on your right knee, making sure the arm is straight and sturdy. Now gently swing your left arm forward and backward, and in a circular motion. You will need a light stick to do this stretching exercise. This will stretch the front of your shoulders. 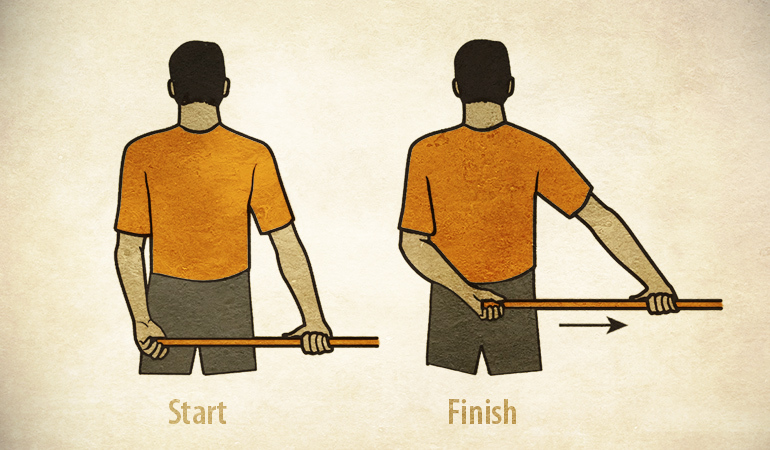 Without bending your arms, hold the stick behind your back with both hands. Pull the stick horizontally to one side, hold for 30 seconds, and then relax. You must pull the stick without twisting or leaning over. When done right, your shoulder will be passively stretched and you will feel a pull without any pain. This will stretch the back of your shoulder. You will again need a light stick. Now push the stick sideways, toward the side that you have just lightly grasped, until you feel the stretch without pain. While doing this, don’t twist your body and make sure your hips face forward. Hold the stretched position for 30 seconds. Then relax for another 30 seconds. This will also stretch the back of your shoulders. 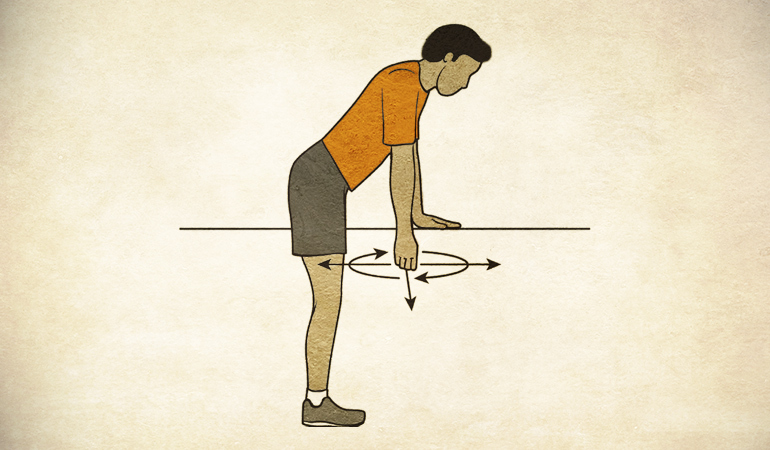 You can sit or stand to do this exercise. Begin by relaxing your shoulders. Pull one arm across your chest as far as possible, and hold the upper arm with the other arm until you feel a gentle stretch across your shoulder. Hold for about 30 seconds, then relax for another 30 seconds. Repeat the sequence with the other arm. This exercise stretches most of your muscles in the upper back. You will need a three-foot-long towel for this stretching exercise. 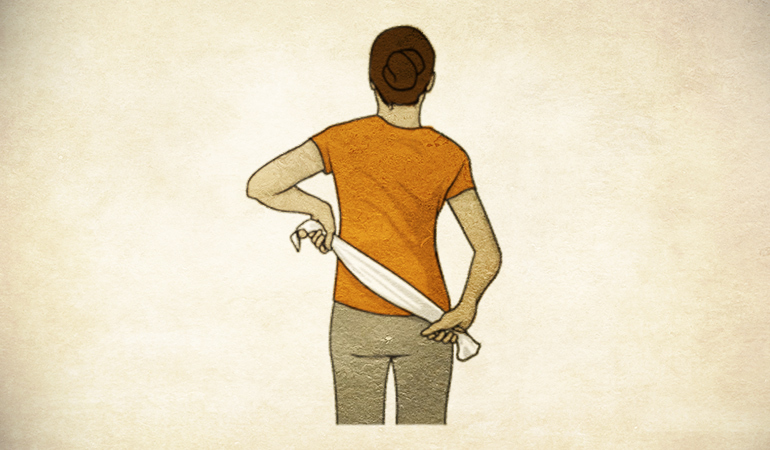 Hold one end of the towel and drape it over your good shoulder. Hold the bottom of the towel with your affected arm. Now pull the towel toward your lower back. Next, use your good arm to gently pull the affected arm upward to your maximum pain-free point. Hold for 20–30 seconds and gently release. This will help increase the flexibility of your shoulder joint, which in turn will help reduce pain. Stand about three-quarters of an arm’s length away from a wall. Stretch out your affected arm and with your fingertips, touch the wall at waist level. Keeping the elbow a little bent, walk your fingers up the wall. Continue until your arm is raised as much as it possibly can without pain. Add strengthening exercises to your routine as your range of motion increases. Don’t forget to first warm up and stretch. As mentioned earlier, the strengthening exercises will make your muscles strong and prevent future injury, reducing your chances of rotator cuff pain. You will feel the effect of this exercise at the back of your shoulder and upper back. The exercise requires an elastic stretch band that will offer you comfortable resistance. If you are exercising in a fitness center, you can use a weight machine instead of the band. Make a three-foot-long loop with the elastic band. Tie the ends together and loop it over something stable such as a doorknob or handle. 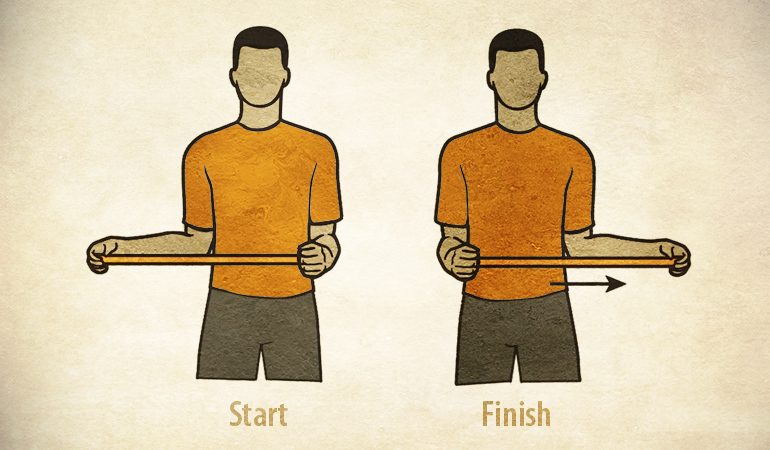 Hold the band with your elbow bent and held against the side of your body. Now pull your elbow straight back, all the while keeping your arm close to your body. While pulling your elbow, remember to squeeze your shoulder blades. Return to the starting position slowly. Repeat the sequence at least three times at first, slowly increasing the number. This exercise has several variations with different effects. In the external rotation exercise, step 1 remains the same. Stand such that the doorknob is on your right side, assuming it is the unaffected side. Now bend your left elbow and hold it close to your body. Grasp the band with your left hand. Still keeping your elbow close to your side, push your arm outward. Hold for a few seconds. While pulling your elbow, squeeze your shoulder blades. Return slowly to the starting position and repeat the sequence. In the external rotation with arm held abducted at 90 degrees, step 1 again remains the same. Grasp the band with one hand. Now bend your elbow at 90 degrees and raise the arm to shoulder height. Pull the band such that your elbow and shoulder are level, and your raised arm is in line with your head. Remember, your elbow must remain in line with your shoulder throughout. The internal rotation exercise works on your shoulder and chest. The first step again remains the same. Hold the band with your elbow and stand such that the doorknob is on your affected side. Keeping your elbow close to the body, pull the band while bringing your arm across your body to the unaffected side. Pull about 2–3 inches and hold for a few seconds. Make sure you keep your elbow pressed to your side throughout. This will stretch as well as strengthen your shoulder joint. 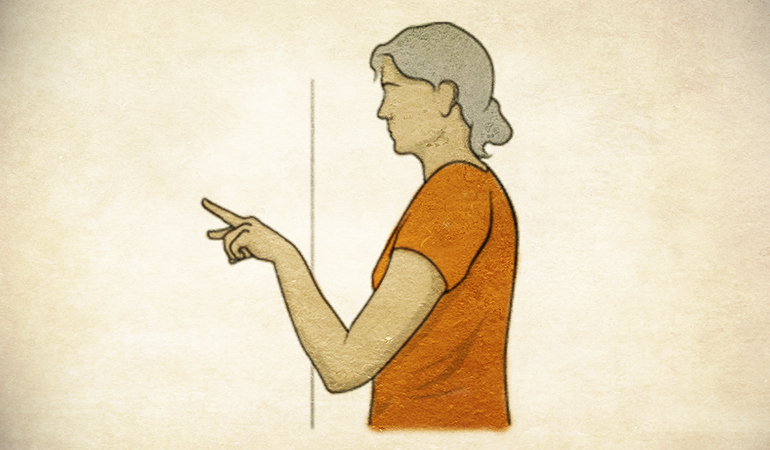 Stand in front of a wall with your arms raised to shoulder level and both hands and feet shoulder-width apart. Lead with your forehead (and not your chin) and perform a push-up on the wall. Keep your hands on the wall at all times and your shoulder blades aligned. You will feel the effect of this exercise at the front of your upper arm. You will need weights that you can lift comfortably without pain to complete at least three sets. Start by standing tall such that your weight is distributed evenly between both feet. 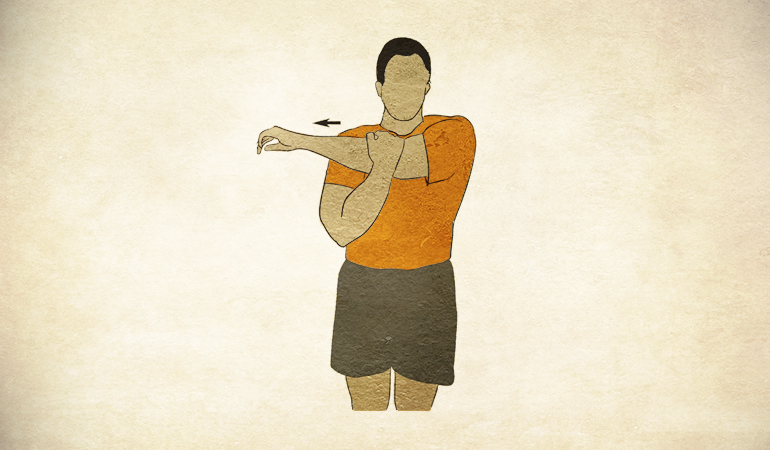 Keeping your elbow close to your body, slowly raise the weight forward to your shoulder level. If you can, raise the weight up to eye level and then above your head. Take care not to swing your arm or do the exercise very quickly. 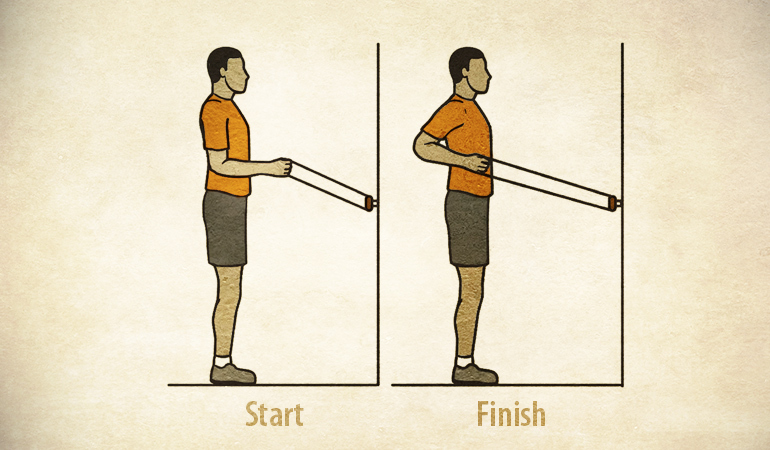 On reaching your desired level, hold for about 2 seconds and then slowly lower your arm. Repeat the sequence 5–10 times per set. A follow-up of this is the elbow extension. The first step of this exercise is the same as that of the elbow flexion. Keeping your elbow close to your body, slowly raise the weight backward as far as you can without bending forward. Hold at the farthest point for a few seconds and then slowly return to the starting position. A variation of the elbow extension affects the back of your upper arm. The first step of this exercise is the same as that of the elbow flexion. Raise your arm and then bend your elbow so that the weight is behind your head. You can use the other arm to support the raised arm. Slowly straighten your elbow and hold the weight above your head for a few seconds. Don’t arch your back and make sure your abdominal muscles are tight. 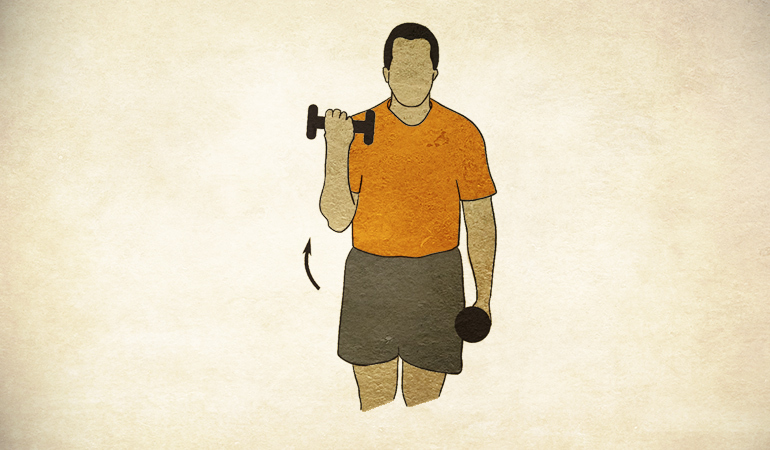 Lower your arm again behind your head with the weight. With this exercise, you will feel the effects in your upper back at your shoulder blade. You will again need weights that you can lift comfortably without pain to complete at least three sets. 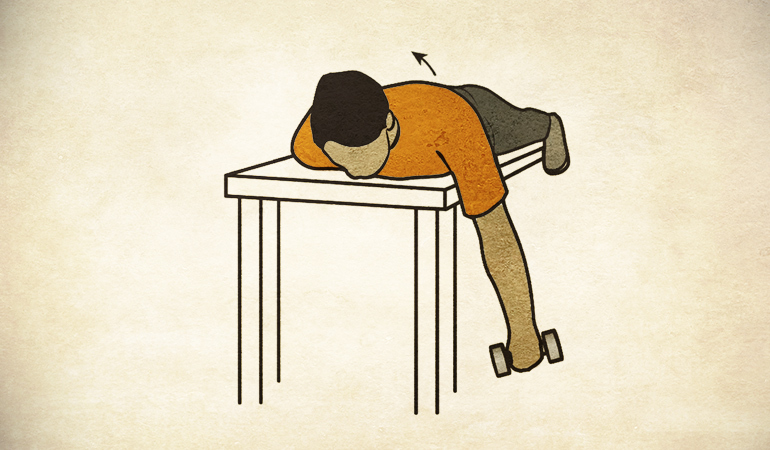 Begin by lying on your stomach on a table or bed, with your affected arm hanging down. Keeping your elbow straight, slowly lift the weight by squeezing your shoulder blade toward the other side. While lifting the weight, don’t shrug your shoulder toward your ear. Hold the furthest position for a few seconds and slowly return to your starting position. A variation of this exercise is the bent-over horizontal abduction. Step 1 is the same. Keeping your arm straight, raise the weight up to eye level. Hold the furthest position for a few seconds and return to the starting position. Lower the weight carefully without any jerky movements. Repeat about 5–10 times per set. Once your shoulder gets stronger, you can increase the weight in increments of 1 pound. It is best not to exceed 5 pounds. There are many more exercises, with variations, that can stretch and strengthen your rotator cuff and help manage the pain. Our list is by no means exhaustive but it is a compilation of some of the most recommended exercises. And remember, the old adage “no pain, no gain” is not always true. Stretch and strengthen only until you feel no pain! 1. ↑ Rotator Cuff Injury. Harvard Health Publishing. 2. ↑ The secret to joint pain relief — exercise. Harvard Health Publishing. 3, 6, 14, 15, 18, 21. ↑ 7 stretching & strengthening exercises for a frozen shoulder. Harvard Health Publishing. 4. ↑ Physical Therapy Exercise for Pain Relief. Spine-health. 5. ↑ Warming Up. The MIT Tae Kwon Do Club. 7. ↑ Do I need to stretch before exercising?. NHS, UK. 8, 22. ↑ Knopf, Karl. Healthy Shoulder Handbook: 100 Exercises for Treating and Preventing Frozen Shoulder, Rotator Cuff and other Common Injuries. Ulysses Press, 2010. 9, 24, 27. ↑ Rotator Cuff and Shoulder Conditioning Program. American Academy of Orthopaedic Surgeons (AAOS). 10. ↑ Shoulder Exercises for Rotator Cuff Repair Rehabilitation Protocol. Massachusetts General Hospital. 11, 12, 13, 20, 28. ↑ Rotator Cuff and Shoulder Conditioning Program. American Academy of Orthopaedic Surgeons (AAOS). 16. ↑ Injury Free: the Best Rotator Cuff Exercises. Men’s Journal. 17, 23, 26. ↑ Shoulder Rehabilitation. Princeton University. 19. 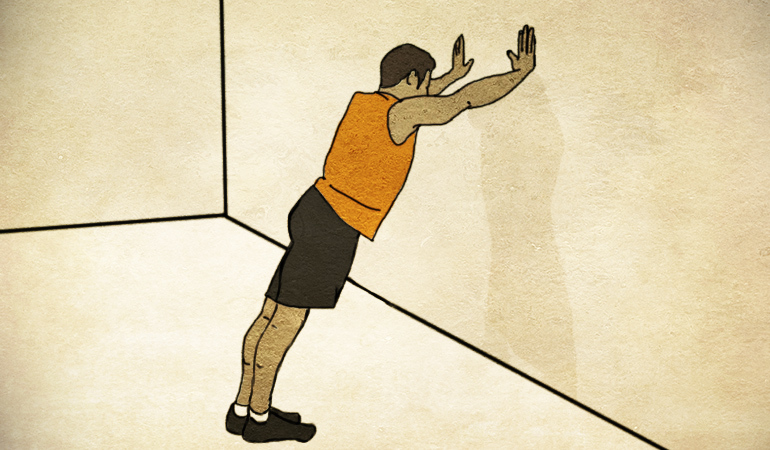 ↑ Exercises for Shoulder Flexibility: Wall Walk. Saint Luke’s. 25. ↑ Shoulder Rehabilitation. Princeton University.